Get a free Slim Jim at Wilco Hess Store. 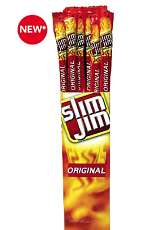 Download the app to get a free slim jim. You also get a free 42 oz drink when it’s your first time to download the app.